Selfies for Good? Or just tapping into a narcissistic trend? 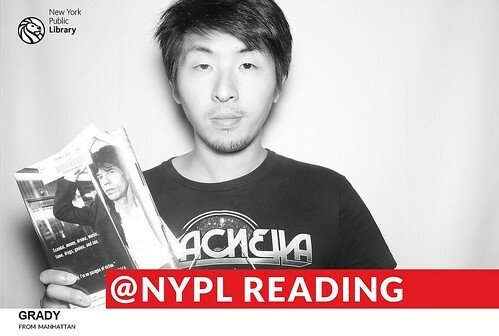 The New York Public Library is using selfies as part of its social media initiative to engage library patrons. A couple of weeks ago, the NYPL installed photobooths at its 42nd Street and mid-Manhattan locations, encouraging visitors to step inside and tweet the results. The photos from both are then immediately uploaded to a Flickr, where anyone can scroll through shots of the library’s enthusiastic patronage. The use of selfies helps mobilize library fans in a new way and make going to the library a more integrated online experience. This is especially critical in the face of severe budget cuts. Anita Jackson pointed out that the immigration reform movement has done a couple of selfie campaigns, including #Fairdoras. Fedoras for Fairness uses the fedora hat as a metaphor for the many hats that women wear to create a brighter future for all. It is also a symbol of the need for immigration reform that treats women fairly, and a declaration that though women wear many hats. Supporters are encouraged to share photos of themselves wearing a hat with the hashtag and say why the campaign is important. This campaign combines the popular selfie with the time honored hold a sign meme. Using photos for online organizing is not limited to the US, it is global. Here is a recent example from Global Voices Online reporting on how activists in the Philippines used selfies to protest train fare hikes. Selfies are not limited to humans. NWF launched this wonderful series “If Wildlife Took Selfies” series on Instagram, using photos contributed by National Wild Life Photo Contest entrants. Here’s some advice for taking your own selfie from NWF. Johnson & Johnson sponsored a contest where they donated $1 for each selfie photo donated through Donate a Photo. Movember, a fundraiser and awareness raising campaign for prostrate and testicular cancer where men grow mustaches on their faces and raise money for cancer charities, also encourages the use of selfies as part its community engagement. Have you seen great examples of nonprofits using the “selfie” meme for good? Share the link in the comments. A few years ago, I remember reading some research about how an image of someone holding a sign with a call to action is much more effective than print alone. I can’t remember if I read it here or somewhere else. Haven’t been able to find that article yet, but if I do I will add the link below. Just from looking at the images above, the one with the woman holding the handwritten sign is easily the most engaging photo for me. Really love that organizations are taking a photography style that is often considered inherently self-absorbed and turning it on its head to be something focused on helping others. Just love that campaign and am going to incorporate it into the post. The photos are amazing. Project Unbreakable uses photos of sexual assault survivors holding signs with quotes from the rapists as a way to give a voice back to victims and raise awareness. Very powerful. Selfies via instagram were used as part of the strikewithme.org campaign (water.org). Selfies with the hashtag #strikewithme were then embedded onto the campaign website. Melissa: Thanks for sharing that example! Melanie: Can’t wait to see what you do! Using selfies for good causes? That’s awesome! I’ve read another article that talks about one of these selfies-for-good-causes stuff and it’s just great. Cheers!